Last night was a late one, as I didn’t get home until 11:30 pm, and was up until two in the morning finishing the blog post for yesterday’s game. It was a really quick turnaround as the game today was at 12:10. I got up at 8:45, ate breakfast, and then had a 30 minute phone interview with Doug Moe, a columnist for the Wisconsin State Journal. I’m not quite sure when his column will run, but I think within the next few days. I quickly showered and was on the road by 10:10. 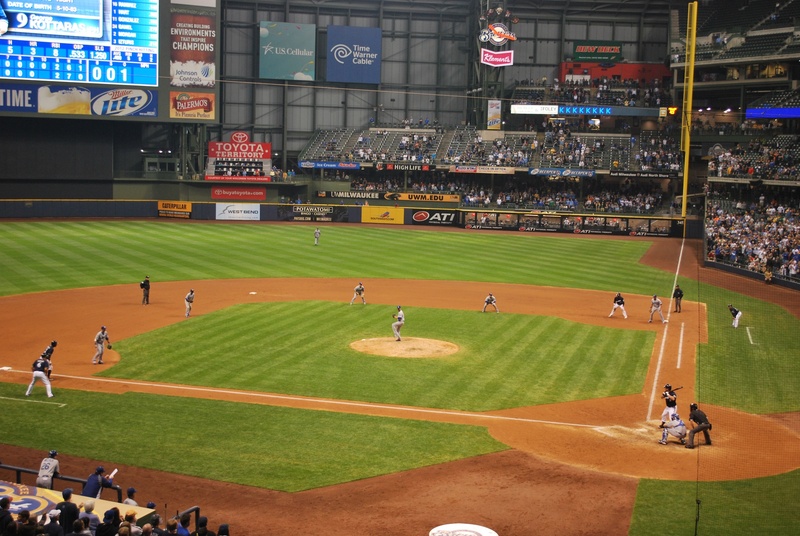 Traffic was decent and I got to Miller Park with plenty of time to spare, at 11:09. This first picture says it all; AMERICA! BEER! BASEBALL! TREES! and WISCONSIN! I have to give credit to the wind for making the picture possible, without it the flags wouldn’t have been “up” for the photo opportunity. 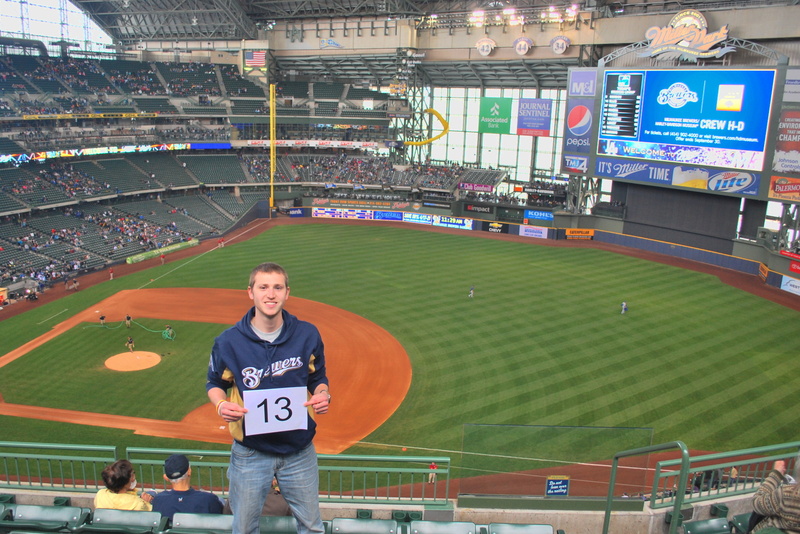 I went inside and returned to the upper deck for game photo number 13. 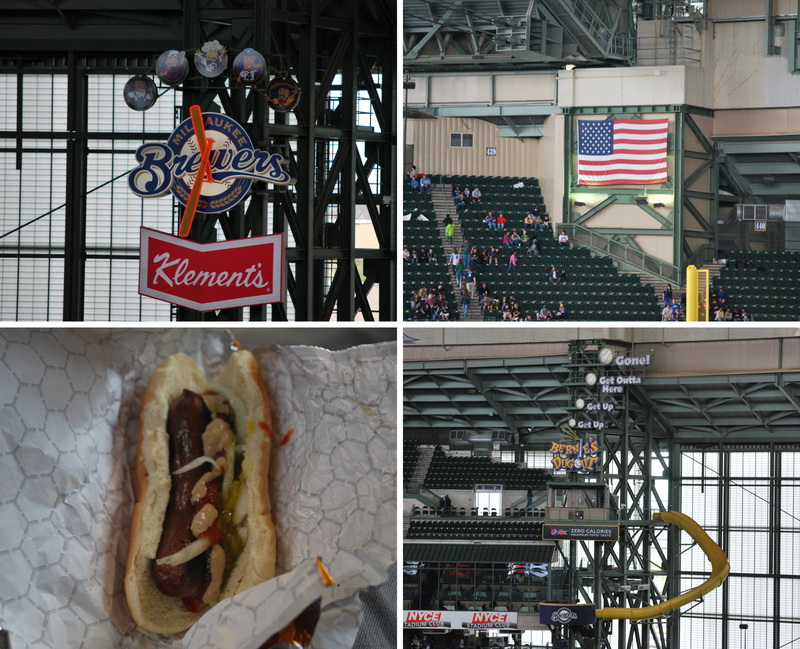 I still had about 40 minutes until first pitch, so I took photos of stuff that I think is interesting/delicious. 1) The Klement’s clock, which is above the right field loge bleachers. It’s one of the clocks that moves only on the minute, and I will occasionally try to witness this. It’s nothing special but I think it’s exciting when the minute hand moves, don’t ask me why, I just do. 2) The American flag, which has been moved to this location since the beginning of last season, I believe. 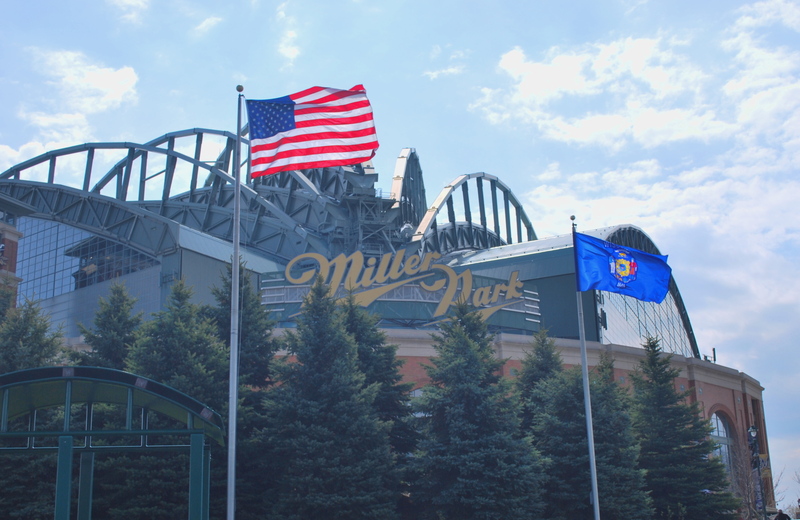 A large American as well as a Wisconsin flag waved alongside the scoreboard in centerfield for the first nine years of Miller Park, and I’m not sure what precipitated the move. My only guess is that it could’ve been distracting to batters when the flags would wave in the wind. 3) Bernie’s slide. Part of the contract that I signed with the Brewers mentioned that I could appear in Bernie’s dugout at some point during the season. I think that would be sweet, but also a conundrum because it might involve missing some pitches. 4) The polish sausage I enjoyed just before the game. The two closest condiment stands were out of sauerkraut, so I was a little upset. I always put on ketchup, mustard, onions, relish, and kraut. If the condiments are free, I’m going to get my money’s worth. As for the game itself, not too much excitement. The Dodgers pushed a run across in the second on a sacrifice fly, but Wolf did a good job of limiting the damage because the bases had been loaded with just one out. The Crew put two on the board in the second, with an RBI double by Ishikawa (his first hit as a Brewer), and a sac fly by Randy Wolf, who did a great job of getting the runner in from third with less than two outs. The Dodgers came right back with two of their own in the top of the third, on RBI singles by Rivera and Ethier. Kemp homered in the fifth to extend the lead to 4-2, but the Brewers cut it to one with a run in the sixth. That was all the scoring at the final was 4-3 Dodgers. The player of the game had to be Jerry Hairston Jr., who made two spectacular defensive plays. He made a diving stop to save a run in the eighth, and then made a barehanded scoop and throw to retire Ishikawa on his bunt attempt leading off the ninth. Well played Jerry, well played. I missed back to back pitches in the third inning, and that wasn’t a typo. I sit on the aisle in section 221, and in the section to my left, a guy was trying to find his seat. There were people in his row and I was intrigued to see what was going to happen. There was no chance of a fight or anything, as it was a calm discussion, but I was still interested. For some reason he thought he was in row 6, but his ticket said row 3, so I have no idea what he was thinking. In the meantime I missed the 1-0 and 2-0 pitches to Matt Kemp, and I wasn’t pleased. Randy Wolf is a quick worker, and you have to be on your game if you don’t want to miss any pitches. I’ll get him next time though. The cute moment during the game occurred when a beer vendor was walking down the aisle. The family on the other side of the aisle consisted of a husband and wife, and their son and daughter. The beer vendor was asking: “Who needs a beer! ?” The little girl, probably aged three, said “I DO! !” It was followed by her mother saying, “not yet sweetie”, it was awesome. Later the little girl was trying to eat peanuts off the ground, much to the dismay of her father. Kids will be kids. On my way back to my car I saw this van in the parking lot, and took a quick picture. 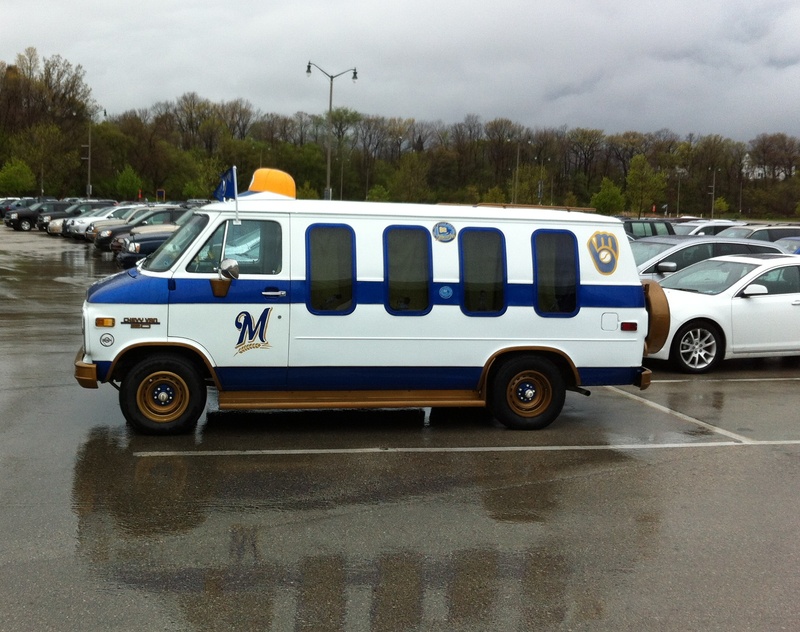 I wonder if the owner drives it all the time, or only takes it to the games. Either way, it’s pretty legit. It’s been a hectic first two weeks of the season, and it’s been tough keeping up with everything. 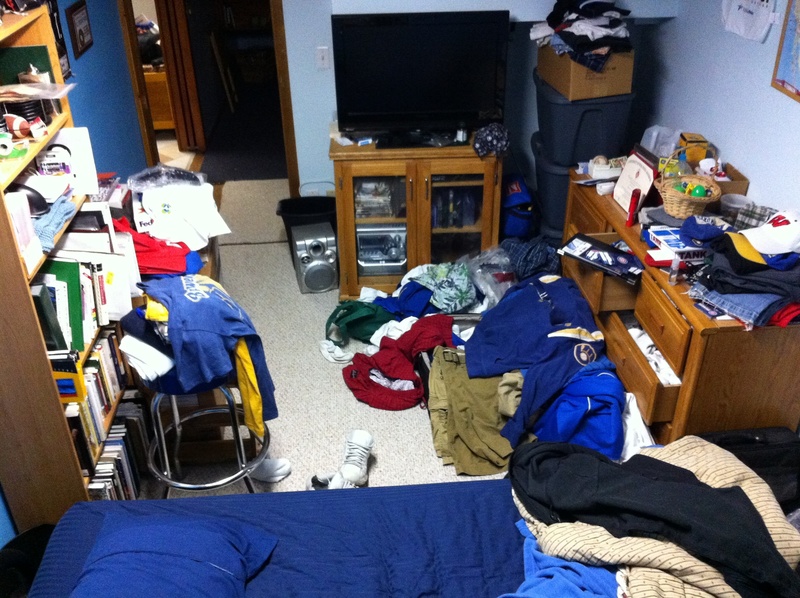 Below is my bedroom at my parents’ place (where I’ll be staying when the Brewers are in Milwaukee). My suitcase is buried under there somewhere, and I haven’t even unpacked it from the recent road trip yet. Since I have over 22 hours before the next game, I should be able to pull things together. I really felt like just sleeping in until noon today (well, yesterday now), we’ll say Wednesday just to be clear. I didn’t get home until 11:30 on Tuesday night, and I was just plain tired. I got up around nine and worked on getting my blog post up, because I don’t want to get behind. I had a doctor’s appointment at 11:45 and made it by 11:50, but wasn’t seen until 12:05, figures. It was my three month check up with Dr. Sanyal, my oncologist since my diagnosis in 2007 (save the year I worked with the transplant doctor). The whole I reason I went with him in the first place was because he was in Fort twice a week, and that summer I was living at home, so it was pretty much by default. He’s brilliant, and I trust him 100%. I’m not bashing any of the other doctors, but I’m just really glad that I wound up with him. He had ordered blood work a few weeks prior, and I had them drawn on April 5th. One of the tests is very complex and is actually sent to the Mayo Clinic in Minnesota to be analyzed, since it’s looking for a possible relapse. There are really two types of relapse, the first occurs in the bone marrow, but will only be apparent in the bone marrow for a while. Eventually, a full relapse occurs and you can see it in the bloodstream. Since I only get a bone marrow biopsy once a year, the blood work is done every three months just to make sure a full relapse hasn’t taken place. Long story short is it was clear, so that was good to hear. I did tell my doctor that my knee has been bothering me. There’s a small bruise on my left knee, but I don’t remember bumping it recently. It hurts every time I take a step, and it’s the worst while going down stairs. He ordered an x-ray and said if it doesn’t get better we’ll have an MRI done. I’m thinking I just strained something, and am hoping there are no micro tears or anything like that. Back to baseball. I had asked the Brewers if I could get one of my “merchandise handouts” a little early, since it would be nice to have a few t-shirts for warmer weather. I’ll be in San Diego two weeks from this past Monday, so I figured I would ask. They obliged and I met with the Director of Merchandise Branding in the team store at 5:15. I picked out two shirts, tried them on, and called it even. 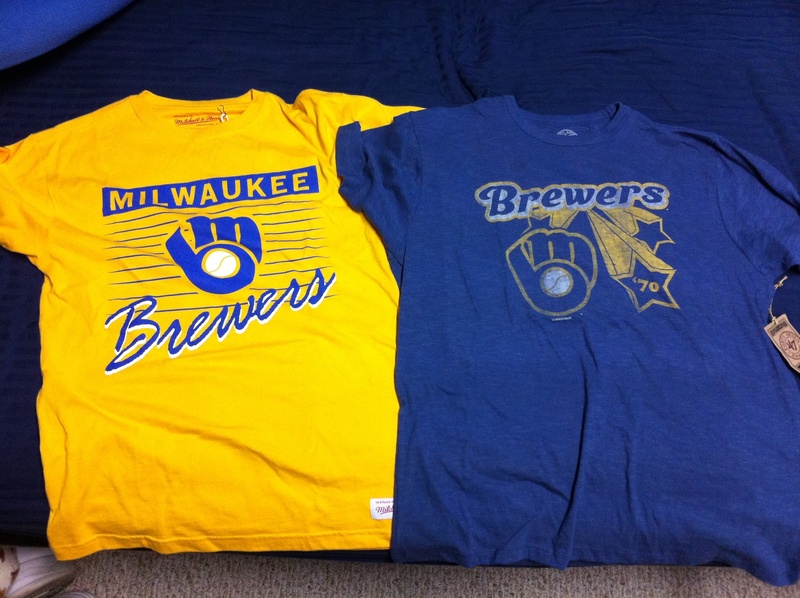 The shirts are pictured below, I really like the yellow one, as I don’t think I’ve ever had a yellow Brewers shirt before. I talked with Jill and a few of the store employees and they were all pretty jealous of what I was doing, and that I get some Brewers’ apparel. It’s those kind of conversations that reinforce how crazy I am, and how lucky I am to have the backing of the Brewers. I was prepared to do this alone, but their help and support is something that I genuinely appreciate. I left the store as the park was officially opening, and went to the left field bleachers to take in some batting practice. In years past I would get to the games early every single time, just to watch batting practice, and try to catch as many baseballs as possible. It kind of lost its luster for me, and I haven’t taken it as seriously as before. I have a bin of baseballs at my parents’ place, and I’m slowly trying to get rid of them. Zack Hample, a writer in New York, has his own blog and has been snagging baseballs since the early 1990’s, and has snagged over 5,000 over the years. He gives some of his baseballs away to kids, and I’ve started doing that as well. I’ll occasionally bring one or two to a game and hand them off to young kids at the games, which is great because they are (usually) very appreciative. I was in the corner spot above the Brewers bullpen when Juan Uribe belted one that was headed right at me. It was a little to my left, out over the bullpen, and I got the tip of my glove on it, only to see it trickle out and fall. It’s not a big deal, but it was a little embarrassing. 1) Dee Gordon (Dodger’s shortstop), taking grounders from his knees, I hadn’t seen that before and thought it looked silly. I know they do stuff like that, but hadn’t seen it in person before. 2) How much the sun comes into play while in the left field bleachers at around 5:50 in the evening. I wish I could say the sun caused me to barely miss Uribe’s HR, but that wasn’t the case. 3) Bob Uecker, as seen from my seat for the 2012 season. I love listening to Uecker, his stories are priceless and a lot of them are self deprecating. I wish I could watch on TV and listen to Uecker, but the delay is unbearable. The radio feed comes in a good three or four seconds before the TV feed, and it spoils it. I like to see replays, otherwise I would just skip the TV altogether. Don’t get my wrong, I think Bill Schroeder and Brian Anderson do a great job, but it’s Uecker, they’d say the same thing. 4) The empty right field bleachers, five minutes before the game. I was very surprised by this, I know it’s a weekday game in April, but come on. They did fill in somewhat, and I’d say they were about 30% full, but who knows if those people actually had tickets for those seats. I think it’s also worth noting Tim Dillard lugging the wheeled suitcase in the lower right corner of that picture. The most junior member of bullpen is responsible for transporting the goodies (seeds, gum, candy), out to the ‘pen. I’ll get a better picture of this later in the year. 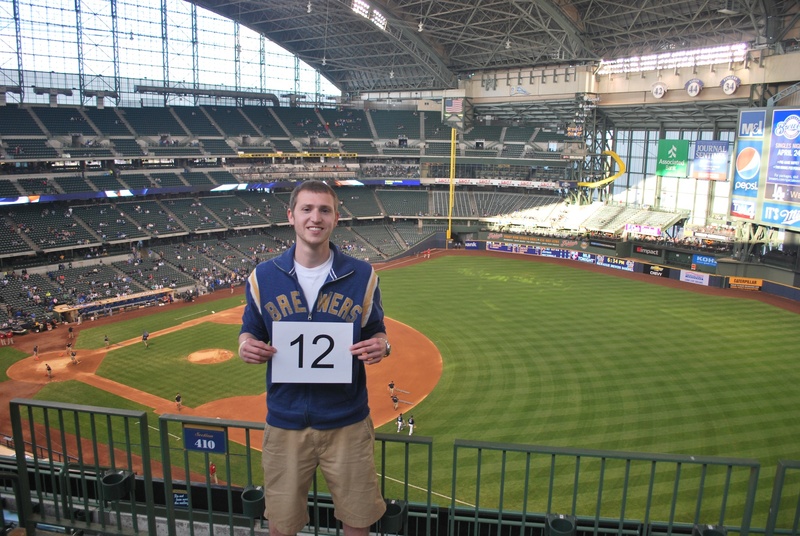 I went to the upper deck sometime in between the second and third pictures to get game number 12 taken care of. I’m trying to figure out how to have a slideshow that’s accessible in the sidebar so you can see the progress as we go forth. 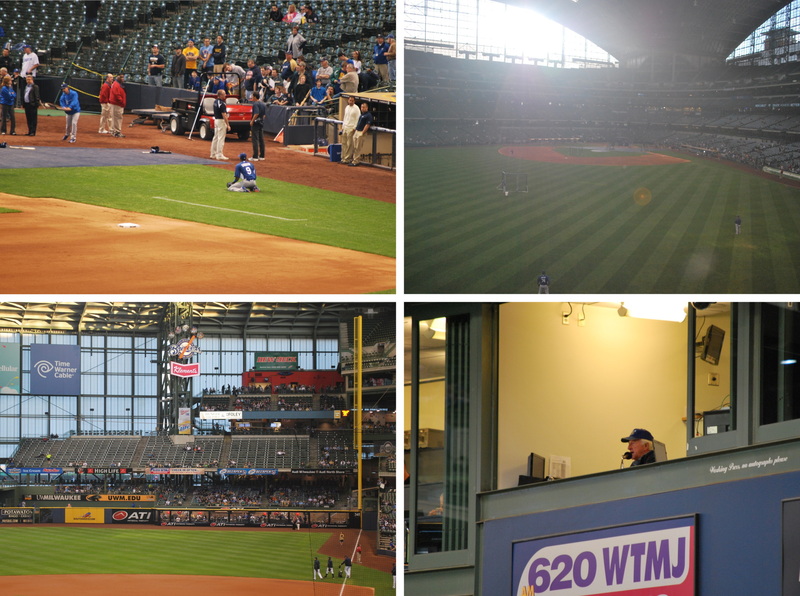 For those that aren’t aware; I’m slowly (a few sections at a time), working my way around Miller Park. Once I get done with the upper deck, I’ll be doing the same thing in the second deck (since you need a ticket to get into the club level). I didn’t want all 81 home games to look the same from my season ticket location, thus the slow moving panoramic. As you can see, the Dodgers brought Jerry Hairston in from the outfield, and used him as a fifth infielder. This is something I don’t think teams do enough of in situations like this. If you’re going to get beat, it might as well be on a well-hit ball, and not by a dribbler that is just out of the reach of one of the infielders. As you can see, Dodgers manager Don Mattingly is arguing with home plate umpire Mike DiMuro, and he has every right to, since it was the WRONG CALL. I’m glad the Brewers “won”, but this is one thing about baseball that really gets me going. WHY NOT EXPAND REPLAY?!?! Right now replay is only used on home run calls, but calls like this are just as influential in the outcome of a game as a home run. 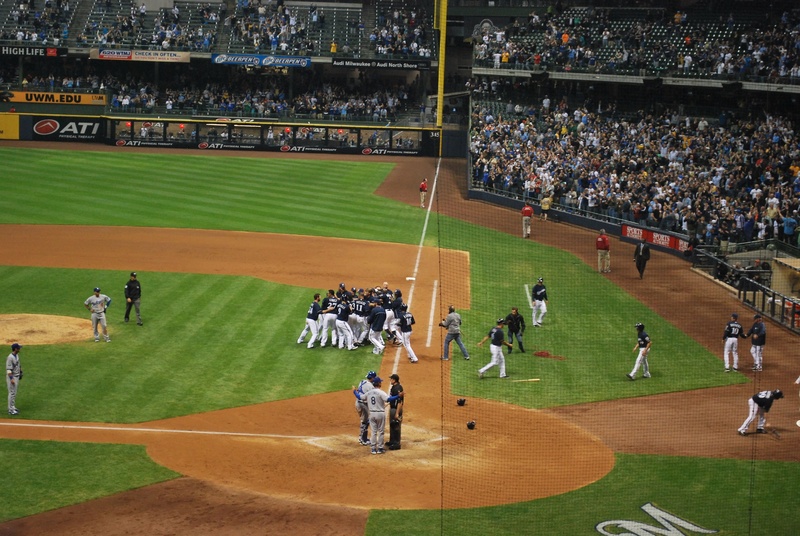 It worked out well for the Brewers this time, but it’s not always going to be the case, and I’ll be even more upset than I am right now. When someone at home, on their couch, in their boxers, can tell that he was out within 10 seconds of the play, why not utilize this technology to get things right. It won’t slow the game down, it might actually speed it up. Whenever there’s a horrendous call, the manager almost always comes out to argue. Instead of this we would have someone upstairs looking at the play, and quickly signal that the call was wrong. It would take 30 to 60 seconds, is that too difficult? I know there’s people who will say “Once the players don’t make mistakes, we can expect the umpires to do the same.” That’s not the point, the point is to see which team does a better job of limiting mistakes, thus winning the game. I don’t want balls and strikes touched, I know that is sacred. Major League Baseball should, however, seriously consider adopting an expanded replay system. For a lot of games it probably won’t even be utilized, because umpires get it right the majority of the time. I apologize for the rant, but it’s something I feel strongly about.